Most people are not aware of how much they’re drinking and are not drinking enough. It’s also very difficult for the body to tell the difference between hunger and thirst. So if you’re walking around feeling a gnawing sense of hung er, you might just be dehydrated. Try drinking a glass of water instead of grabbing a snack. Drinking a glass of water right before a meal helps you to feel full and eat less. 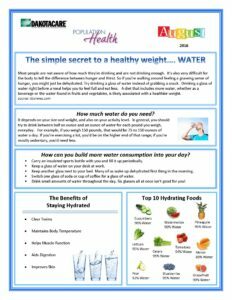 A diet that includes more water, whether as a bev erage or the water found in fruits and vegetables, is likely associated with a healthier weight.